Successfully Added Blingmax - Bluetooth Wireless Headset to your Shopping Cart. Get the attention you deserve with the hot new Blingmax Bluetooth wireless headset for left or right ear! It effortlessly pairs with your cellphone using Bluetooth version 2.0 so you can wheel and deal as well as look oh so cool at the same time! What to get for your favorite gangsta? Whether it's birthday or Christmas time, we all know how hard it is to shop for your favorite gangster. What do you get for the man who has the whole city on lockdown? He already has two Humvees, one Maybach, and a room full of Uzis. The answer? Get your favorite Nino Brown or Tony Montana the Blingmax - Bluetooth Wireless Headset! The benefit to him? Instead of holding onto his phone, this wireless Bluetooth earphone gives him the freedom to tote two techs! What to get for your favorite rapper? You're the Creative Director for the new Lil Jon video. You know Lil Jon...Get Low, get low, skit, skit...well his new song is gonna be a club bangin' chart buster and you've been called in to lend your expertise. After looking over the storyboard you realize that something is missing. The standard props are there, namely pimp sticks and pimp cups, but...the whole ambience is lacking. Then you figure it out...what this rap video needs is more bling. 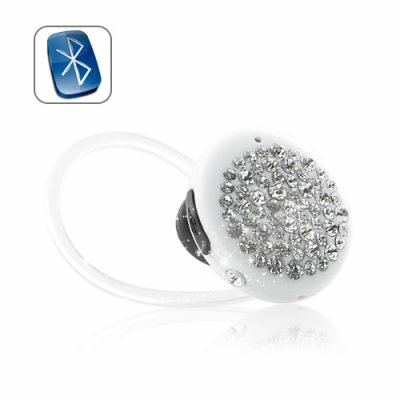 Say hello to the Blingmax - Bluetooth Wireless Headset! Trusted to be diamond encrusted! Yeah! What?! All kidding aside, the BlingMax is the perfect attention getter which makes it the perfect gift for your flirty divorced mom or your white and nerdy gangsta wanna be brother! Brought to you by the online leaders of bling - Chinavasion. You only need to pair your headset once and then thereafter it will automatically connect with your mobile phone. To switch it on, press and hold the multifunction button for approximately 4 seconds. This Bluetooth wireless headset can be used up to 10 meters away from your mobile phone. How long does a fully charged battery last for? The talk time is around 4-5hours. When I am searching for devices, what name will I see for this Bluetooth headset? What is the passcode for pairing this Bluetooth earpiece? The default code is 0000.